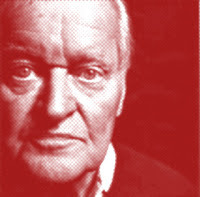 The year '07 brought us a "selected later poems" from John Ashbery, a gorgeously designed volume (a large pastel-color-surrounded lower case mod-yet-serif "a" on the jacket) called Notes from the Air. First thought about the subtitle: a person must be and feel really old to consent — not sure how readily John did — to the phrase "late poems," although at least it's not "last poems" (that's in truth for later). Nonetheless, it's accurate. In the sense Edward Said meant it, as he himself, toward the end, was a later-filled person, these poems have the style and rhetoric of later. Someone might or has already argued that poetically JA was always already an old guy. His Harvard poems seem the work of a 50 year old — e.g. "Some Trees" with its "as far this morning from the world as agreeing with it." But in these poems one hears the lateness and untight-lined-ness of Wallace Stevens' long poems of the late 1940s and early 50s, e.g. "The Auroras of Autumn" and "An Ordinary Evening in New Haven." and then see what explanations they give. The thought does not end with the simple or easy unchaining of the tiger inside the sleepy-wakeful old poet. Things have quieted down, or you've successfully drawn away from the noise, and that's why the tiger — you'd think it'd be associated with the noise of early and mid-life wildness — can or will be liberated in you now. But then — well enough never left alone in Ashberyian rhetoric — we realize that once the tiger in you is free we are (yet again) waiting, waiting for something the arrival of which is not clear. Who is the "they" that will given the explanations? Not the tiger, which would be "it" or "he." Not the poet, the "I" who can't explain why old age brings back those earlier years, but a plural external authority or corrective agency. So the liberation of the wild inside — in the poem itself? — never gets realized in the poem, as there's always one more qualification before such freedom can ever be attained. Which is to say: never. Yet one tries, and tries. And that's what the poems are, at this point. Gorgeous. ** See the very end of Stevens' "The Man with the Blue Guitar."